Occurrence: Apple is consumed as fresh and processed fruit as well as in juices, jams, jellies, and cider. Apple pectin is used as a gelling agent. Like many other allergies to fresh fruits and vegetables, apple allergy can take two different forms. In the North of Europe, people with birch-pollen allergy can develop an apple allergy due to the similarity between a protein in birch that causes birch-pollen allergy, and an apple protein. This is called the birch-apple syndrome with symptoms generally appearing within 5-15 min after consuming raw apple and comprising local reactions in the mouth and throat with itching and inflammation (called oral allergy syndrome, OAS). The molecule, known as an allergen, involved in this kind of allergy does not survive cooking and pasteurisation. Therefore, people who react to this allergen can tolerate cooked apple and juices. Individuals often develop adverse reactions to other fruits including pear, apricot, melon, banana, nuts such as hazelnut, or vegetables such as celeriac (celery tuber) and carrot. In Mediterranean countries, people with apple allergy do not have birch-pollen allergy. Instead they often have allergy to peach. These individuals develop adverse reactions to apple because of the similarity between the allergens in peach and apple. Symptoms are more severe including generalised urticaria, abdominal pain, vomiting and life-threatening symptoms, sometimes in addition to the OAS. These individuals tend to have more frequent and severe reactions when fruits are eaten with the peel. They also tend to develop adverse reactions to other fruits including peach, apricot, plum, cherry, nuts (such as hazelnut and walnut) and peanut. The protein (allergen) that causes this kind of allergy is tough and the allergenicity survives in processed foods such as purees, nectars and juices. As a result, individuals with this kind of allergy cannot eat even processed apple. 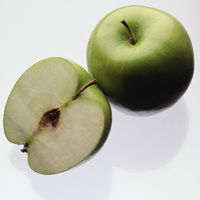 The amount of allergen in the fruit is influenced by the apple variety, the degree of maturity and storage conditions. Whereas over-mature and freshly harvested fruits have highest levels of the peach related allergen, long storage increases the levels of pollen-related allergen. No hypoallergenic fruits have been produced by breeding so far. Apple is a fruit belonging to the Rosaceae family of fruits. This family comprises many of the most widely consumed fruits in the Northern Hemisphere such as pear, strawberry, and the stone fruits peach, apricot, plum and cherry. Apple allergy is a so-called IgE-mediated food allergy. IgE (Immunoglobulin E) is the allergy antibody. Allergy to apple is caused by proteins in the fruit, the apple allergens. The most important apple allergens have been identified. Apple allergy is often seen in patients with hay fever in early spring caused by pollen of birch alder and hazel. The reason that these allergies frequently go together is that pollen from these trees contain similar allergens as those present in apple. On the basis of this similarity, IgE antibodies of patients with tree pollen allergy also recognize apple allergens. This is called cross-reactivity. The allergens involved in this phenomenon are called Bet v 1 and Bet v 2 in birch pollen and Mal d 1 and Mal d 4 in apple. Bet v 2 and Mal d 4 are so-called profilins. This cross-reactive syndrome only occurs in areas with significant exposure to birch pollen, i.e. in Northern and Central Europe. Allergy to apple however, also occurs in Mediterranean countries like Spain, Italy and Greece where exposure to birch pollen is absent. Cross-reactivity with grass pollen which also has a similar profilin allergen can be the cause apple allergy in these areas. Often however, apple allergy in the Mediterranean area is seen independently from pollen allergies. In these cases, another allergen is responsible for the reactions. This allergen is called lipid transfer protein (LTP), but is also referred to as Mal d 3. LTP is an extremely stable protein that is resistant to food processing and to gastro-intestinal digestion. Most apple allergic patients notice itching of mouth and throat, and itching, redness and swelling of the lips, within the 5-15 minutes after eating the fruit, or even while chewing and swallowing it. These symptoms disappear 15 to 60 minutes later. This is known as the “oral allergy syndrome”. Some patients present more serious reactions after apple intake, preceded or not by the oral symptoms, and with a variable involvement of the skin, the gastrointestinal and respiratory tracts, and/or the vascular system. At the skin, patients develop nettle rash (urticaria) with or without swelling (angioedema). When present, swelling most frequently affects face, lips and eyelids. The gastrointestinal involvement manifests as stomach burning or pain, cramps, vomiting, and/or diarrhoea. The respiratory tract is less frequently involved, but patients can present with itching of the nose, sneezing, a runny nose (rhinitis) and/or cough, chest tightness, wheezing and short breath (asthma). Some apple allergic patients may develop generalised reactions with involvement of the skin together with other organs. These generalised allergic reactions are known as anaphylaxis and are a medical emergency. Fortunately, only a minority of patients with anaphylaxis present a decrease in blood pressure (hypotension). This is the most severe and life threatening allergic reaction known as anaphylactic shock. Other life threatening reactions such as severe asthma attack or laryngeal or glottis oedema (swelling in throat) are exceptionally observed. There are regional differences in the manifestations of apple allergy within Europe. In North and Central Europe apple allergy is observed in patients allergic to birch pollen. The allergens involved are easily destroyed by digestion in the gut, and thus can only induce local contact reactions in the mouth and throat where they are still intact. This explains why oral symptoms are for most of the patients the unique manifestation of this food allergy. The lability of these allergens also explains why reactions are only induced by fresh apple while processed foods containing this fruit, including apple juices, are generally well tolerated. In contrast, in Mediterranean areas without birch trees, apple allergy is caused by LTP and is often severer. The majority of patients also have oral symptoms, but generalised reactions such as urticaria and anaphylaxis appear in more than 1/3 of patients. All the patients react to fresh apple, although some of them can tolerate the ingestion of the peeled fruit. The explanation for this is that LTP is more abundant in the peel of apple. Foods containing processed apple commonly induce allergic reactions. Allergy to apple in patients with birch pollen allergy frequently goes together with allergy to other related fruits, like pear, peach, cherry, apricot, plum and strawberry. Those patients often also have allergy to tree nuts like hazelnut and to a lesser extent almond and walnut. These types of birch pollen related fruit and nut allergies are exclusively seen in areas with exposure to tree pollen from birch, alder and hazel. Mainly in the Central European part of this area, some vegetables like carrot and celery have also been linked to this syndrome. Peanut allergy can also be a part of it. All these combined reactivities can be explained by the presence of similar allergens. As said, this phenomenon is called cross-reactivity. Grass pollen allergic patients with cross-reactive fruit allergies are common in the Mediterranean area. The spectrum of fruits that is potentially involved in allergic reactions is overlapping with the birch pollen related foods but is even broader. In Spain melon and banana have been shown to be among the foods that are frequently linked to grass pollen fruit cross-reactivity. Allergy to apple caused by IgE antibodies against LTP is almost exclusively seen in patients with peach allergy. This suggests that peach is the cause of the allergy. There is some evidence now that other fruits like grape (Greece) can also cause LTP allergy. The spectrum of foods that can cause reactions in LTP patients is very similar to those involved in the birch pollen apple syndrome: peach, pear, cherry, apricot, plum, nectarine, hazelnut, walnut, and almond. In some cases, allergy to LTP can be linked to symptoms induced by other plant foods like peanuts, string beans, salad, corn, grapes including wine and barley and wheat including beer. Apple is most frequently involved in food allergic reactions in adolescents and adults. Females are affected twice more frequently than males. Apple allergy is the most frequent food allergy in Central and Northern Europe in areas rich of birch trees, whereas peach is the food most frequently involved in allergic reactions in the Mediterranean area in countries such as Spain, Italy and Israel. Allergy to birch in areas with significant exposure to birch pollen is observed in around 10% of the population. Of these patients up to half will have allergy to apple. This means that up to 5% of the population is affected by apple allergy. Apple allergy in areas without birch pollen is much rarer. The exact frequency has not been established. Birch pollen related apple allergy comes up after the occurrence of hay fever. In general, hay fever develops in the school age (roughly between 5 and 15 years), usually followed by apple allergy several years later. In practice this means that apple allergy develops in the teenager years or later. Birch pollen allergy is usually not outgrown, and consequently apple allergy is life-long as well. Apple allergy related to LTP usually develops around puberty. In most cases, peach allergy precedes the occurrence of apple allergy. As far as known now, this form of apple allergy is not outgrown. There are no studies available that have reliably established how much apple is enough to trigger an allergic reaction. It is expected that this quantity will be different in patients with birch pollen related and LTP-related apple allergy. In a small group of patients with birch pollen related apple allergy it was shown that 5 grams of an apple gave a reaction during a challenge. This is a small bite of apple (an average apple is 200-250 grams). Differences in allergenicity between apple varieties have been demonstrated. Apple allergy is suspected on the basis of the medical history which establish the relationship between the contact with the fruit and the appearance of symptoms, it is supported by the demonstration of specific IgE by means of skin and blood tests, and it is confirmed by an oral challenge. The best test to demonstrate a sensitisation (presence of specific IgE) to apple is the prick-prick test with fresh apple. In this test the lancet is plunged several times into the fruit immediately before pricking the patient’s skin with it. The sensitivity of this test (the frequency of positive results in allergic patients) is high, generally over 80%. Peel and pulp can be tested separately. False negative skin tests are frequently found with commercial apple extracts, especially in patients sensitised to labile allergens which can be modified during the extract preparation. This factor can also reduce the diagnostic performance of the commercially available blood tests for the detection of serum IgE to the fruit. In the clinical practice it is rarely indispensable to make oral challenges to confirm the clinical suspicion if the symptoms are unequivocal (which is almost always the case), and the patient presents specific IgE to apple. In those patients with anaphylaxis in whom specific IgE is demonstrated, oral challenges should not be performed. Where do I find apple? Apple is of course primarily eaten fresh as a whole fruit. It is also a major component of fresh fruit salads. Dried apple is used in products like candy bars, breakfast cereals, and tuti fruti. Apple is used in yoghurts and deserts, fruit juices and apple sauce. Apple is frequently used in cakes, pies and other pastries. For those patients that have apple allergy as a result of their pollen hay fever, only fresh fruit is causing symptoms, processed apple has lost its allergen activity. For patients with LTP-related apple allergy, processed apple is causing symptoms as well. It is important to realize however, that patients with pollen allergy can at the same time also have LTP-related apple allergy. Apple is not a common ingredient in non-food products. It is however used in some hygiene products like shower gels, soaps and shampoos. The only recommendation to apple allergic patients is the strict avoidance of the fruit. This is especially important in the population from the Mediterranean area sensitised to LTP that is at risk of severe reactions. They should avoid fresh apple as well as apple processed products. Certain patients with previous anaphylaxis or anaphylactic shocks should be trained in the early recognition and treatment of reactions in case of accidental ingestion, and given rescue medication including adrenaline (epipen). Patients with apple allergy linked to birch pollinosis should avoid fresh apple. Avoidance of apple processed products is generally unnecessary, but if their tolerance is unknown it should be assessed at the allergy clinic before allowing their ingestion. If the tolerance to a related cross-reactive food (such as other Rosaceae fruits) is not known or has not been assessed after a confirmed diagnosis of apple allergy, patients should avoid it. This is again especially important in patients sensitised to LTP who have had serious reactions with apple. The effect of birch pollen immunotherapy on the linked apple allergy has been investigated. Some investigators have found a beneficial but seemingly transient effect. Three years after birch pollen immunotherapy is stopped half the patients are again reactive to apple. Apple is not included in the list of foods of the recent new legislation of the EU on food labelling (EU Labelling Directive 2003/89/EG and list of Codex Alimentarius Commission on mandatory labelling of pre-packaged food). This means that patients can not completely rely on food labels if searching for the presence of apple. When apple allergy is associated with birch pollinosis symptoms generally appears within 5-15 min and comprise local reactions of the mucosa of the upper aero-digestive tract with itching, inflammation and angioedema (called oral allergy syndrome, OAS). (Pastorello et al. 1999) ; (Anhøj et al. 2001) . When apple allergy is not linked to birch pollinosis the most frequent clinical presentation is not OAS, but systemic symptoms such as generalised urticaria and anaphylaxis are more commonly observed, specially in those patients without an associated pollen allergy. (Fernandez-Rivas et al. 1997) . In these patients, clinical data also suggests that adverse reactions appear more frequently and are more severe when fruits are eaten with the peel (Fernandez-Rivas and Cuevas 1999) . Commercial apple extract: Anhøj et al. (2001) , Osterballe et al. (2003) . Low temperature acetone powder extract of apple (A72): Osterballe et al. (2003) . Authors agreed that although the diagnostic value of the prick-prick technique with fresh apple is useful, it is still very problematic that the expression of the major allergen Mal d1 varies between different apple strains and maturation stages (Osterballe et al. 2003) . It is also of concern that fruit allergen extracts are often readily degradable or contain clinically irrelevant cross-reacting epitopes, resulting in diagnostic discrepancies (Anhøj et al. 2001) . In most of the studies skin prick tests (SPTs) were considered positive when the wheal area was ≥7 mm2 (diameter ≥3 mm). Asero et al. (2001)  described negative SPTs wheals <2 (with diameters <50% of the diameter of the positive control which was 10 mg/ml histamine). Osterballe et al. (2003)  also peformed scratch-chamber test (SCT) which was regarded as positive with a wheal-and-flare reaction. 33 patients showing clinical symptoms after the ingestion of apple, peach and/or pear (at least one of them) and a positive SPT response to the involved fruit/s. 22 patients had an associated grass pollinosis (fruit and pollinosis group) and 11 did not present any type of inhalant allergy (fruit group). Adverse reactions to apple were reported by 25 subjects, 15 of the fruit and pollinosis group and 10 patients of the fruit group. (Fernandez-Rivas and Cuevas, 1999) . 36 patients with OAS after ingestion of fruits. 18 patients did not have birch pollen sensitivity and the other 18 had bich pollinosis (Asero et al. 2001) . 65 birch pollen-allergic patients with a history of rhinitis in the birch-pollen season, positive specific IgE to birch and a positive open oral challenge with apple. Skamstrup Hansen et al. (2001) . 10 adults diagnosed with IgE-mediated clinical allergy to apple from history and by skin tests (SPT), and/or food-specific IgE antibodies, and oral challenge. Crespo et al. (2002) . Fernandez-Rivas and Cuevas (1999)  found that more than 40% of patients allergic to apple tolerated the ingestion of the pulp, and reactions were only elicited by the intake of the whole fruit. SPTs with peels of apple induced significantly higher responses than the pulps, both in fruit and pollinosis and in fruit allergic patients. Anhøj et al. (2001)  found that the diagnostic sensitivity of the SPT with fresh apple fruit was 92% and specificity of 72%. Good concordance (test efficiency of >80%) was found between case history, SPT, and oral challenge tests. The negative predictive value of the SPT was >90%. A combination of case history of Oral Allergy syndrome with a SPT or basophil histamine release with fresh apple resulted in >90% positive predictive value. In both patients groups with and without birch pollinosis, the SPTs with fresh apple and apple peel extract were positive and negative with apple pulp. In non birch pollen-allergic patients, the SPTs with fresh apple gave inconsistent results, therefore Asero et al. (2001)  suggests diagnosis of vegetable food hypersensitivity in birch pollen-allergic patients using fresh foods but fruit peel extracts for patients not allergic to birch pollen. Skamstrup Hansen et al. (2001)  reported that groups I and II had higher skin wheal area to birch than group III (P=0.02/0.04). The freeze-dried apple powder proved to be useful for SPT but further investigation of the stability and the allergenic profile of the material is needed. Skamstrup Hansen et al. (2001)  could not confirm an increase in reactivity during season by SPT. Crespo et al. (2002)  SPT determinations were positive to apple in 23/30 (77%). Osterballe et al. (2003)  demonstrated that the SPT had a high sensitivity to fresh apple peel (80%), apple pulp (70%), A72 (90%), birch (100%), and low to the commercial apple extract (10%). The authors concluded "In daily practice a detailed case history about symptoms of oral allergy syndrome combined with a SPT with fresh apple peel or low temperature acetone powder extract of apple will be useful"
Whole fruit cv. Golden Delicious: Skamstrup Hansen et al. (2001)  and (2001) , Osterballe et al. (2003) , Rossi et al. (2003) . IgE protocol:CAP: Fernandez-Rivas and Cuevas (1999) , Skamstrup Hansen et al. (2001)  and (2001) , Osterballe et al. (2003) , Rossi et al. (2003) . Rossi et al. (2003)  expressed the results in classes of positivity from 0 to 6, where class 0 corresponds to <0.35 kUA/l, class 1 to 0.35-0.7 kUA/l, class 2 to 0.7-3.5 kUA/l, class 3 to 3.5-17.5 kUA/l, class 4 to 17.5-50 kUA/l, class 5 to 50-100 kUA/l and class 6 to >100 kUA/l. Magic Lite (ML): Skamstrup Hansen et al. (2001) , Osterballe et al. (2003) . Measurable specific IgE to apple was classified as a positive when ML = 1.44 SU/ml. RAST and RAST inhibition: Apple peel RAST was inhibited by itself and by its pulp, and vice versa (Fernandez-Rivas and Cuevas 1999) . A release greater than 10% (Fernandez-Rivas and Cuevas (1999)) . An AUC of >40 ng/ml and a release of >20 ng/ml histamine (Anhøj et al. (2001)) . Maximal release is ≥14 ng/ml (Skamstrup Hansen et al. (2001) ). 65 birch pollen-allergic patients with a history of rhinitis in the birch-pollen season and positive specific IgE to birch. Skamstrup Hansen et al. (2001) . Fernandez-Rivas and Cuevas (1999)  found that total IgE was significantly higher in the fruit and pollinosis group (mean 481.42 kU/L) than in fruit group (mean 152.73 kU/L). RAST to apple peel was significantly higher than RAST to pulps in the fruit patients, but no significant differences were observed in the fruit and pollinosis group. Fruit peel RAST was inhibited (from 60 to 97%) by itself and by its pulp, and viceversa. The area under the curve of histamine release was larger for peels of apple. Histamine release tests with apple gave sensitivity of 71% and specificity of 93%. Anhøj et al. (2001) . Skamstrup Hansen et al. (2001)  found that specific IgE against apples cv. Golden Delicious increased during birch pollen season (P<0.05). None of the patients had positive specific IgE against apple measured by the Magic Lite system. Similarly, Osterballe et al. (2003)  reported that the CAP test showed a higher diagnostic sensitivity (100%) than the Magic lite test (10%) for apple. The Histamine release test showed a high sensitivity to birch (90%), A72 (90%), Mal d1 (70%) and low to the commercial apple extract (25%). Rossi et al. (2003)  found that 162 sera (43.55%) contained specific IgE to apple extract (75.35% of birch pollen Bet v 1 positive sera). The authors concluded "In this study we observed that three birch pollen recombinant allergens alone, could sufficiently identify 90% of birch pollen-sensitive patients". The proteins were electroblotted to a nitrocellulose sheets with pore size 0.2 µm. The sheets were cut into 5 mm strips and blocked with phosphate-buffered saline pH 7.5 with 0.5% (v/v) Tween 20 and 0.5% (w/v) bovine serum albumin for 30 min. Strips were incubated with diluted (1:4) sera overnight. The IgE-binding components were detected with iodine 125–labeled rabbit anti-human IgE antiserum. Bots were visualised by autoradiography (Ebner et al. 1995) . Anhøj et al. (2001)  and Pastorello et al. (1999)  used fresh apple. Skamstrup Hansen et al. (2001) . Model I: fresh apple juice and additional blackcurrant juice. Model II: freshly grated apple and additional grated cabbage and apple juice. Skamstrup Hansen et al. (2001)  used grated cabbage, pasteurisated apple juice and grated apple (Golden delicious) for DBPCFC, and whole fresh apple (Golden delicious) for open challenge tests. Skamstrup Hansen et al. (2001) , Bolhaar et al. (2004) . Yes. Skamstrup Hansen et al. (2001) ; Rodriguez et al. (2000) . DBPCFC and open challenge. 65 birch pollen-allergic patients with a history of rhinitis in the birch-pollen season and positive specific IgE to birch, and positive open challenge with apple. For comparison of the DBPCFC models, patients with a positive open oral challenge ith apple were selected. Skamstrup Hansen et al. (2001) . From 4 to 64 g. Pastorello et al. (1999) . Model I: 5-50 ml. Model II: 20 g. Model III: 3 g. Skamstrup Hansen et al. (2001) . 20 g of grated apple. The authors note that only a low dose of apple could be used because of the flavour and suggest that more positives would occur if a higher dose were used. Skamstrup Hansen et al. (2001) . A bite of an apple. Anhøj et al. (2001) . Oral allergy syndrome symptoms were classified in 4 grades of increasing severity: grade 1, only oral mucosa symptoms (22/32 and 9/11) ; grade 2, oral mucosa and gastrointestinal symptoms (1/11); grade 3, oral mucosa symptoms plus systemic symptoms (urticaria, rhinoconjunctivitis, or asthma) (2/32 and 1/11); grade 4, oral mucosa symptoms plus life-threatening symptoms (laryngeal edema, anaphylactic shock) (7/32). Pastorello et al. (1999) . Oral allergy syndrome: rhinitis, conjunctivitis, and local reactions at the oral cavity. Skamstrup Hansen et al. (2001) ; Anhøj et al. (2001). Skamstrup Hansen et al. (2001)  found: Model I (17 positive, 13 negative, placebo 10 positive), Model II (14 positive, 5 negative, placebo 0 positive) and Model III (15 positive, 6 negative, placebo 4 positive). The authors concluded "It is highly desirable that the sensitivity of the DBPCFC with apple is increased further. Lyophilization of apples produces material useful for oral challenges and has some practical advantages over fresh apples, but an investigation of the long-time stability and the allergenic profile of the freeze-dried material is needed. Skamstrup Hansen et al. (2001)  found that before the pollen season, 14/26 blinded challenges were positive, against 19/27 open challenges. During the pollen season, 16/26 blinded and 20/26 open challenges were positive. 1 positive placebo in each case with a different patient. None of the patients reacted to the blinded challenge without a subsequent reaction to the open challenge. The scores of the open challenge were significantly higher than the scores of the DBPCFC both before the season and during the in-season challenges (P<0.05). Authors agreed that the diagnosis of oral allergy syndrome to apple has been complicated by unstable apple extracts and the changes of the allergenicity of apples during ripening, the test technique, the disease prevalence and the number of the patients included in studies. Wensing et al. (2002)  studied "fifty-two patients with pollen allergy and IgE against at least one plant-derived food. "; "Sensitization to Bet v 1 was associated with IgE against apple, hazelnut, and peach, whereas sensitization to profilin was associated with positive RAST results to all investigated plant-derived foods except apple, peach, and melon." Asero et al. (2003)  tested for IgE against Bet v 1 and Bet v 2 (profilin). They find that Bet v 1 +/Bet v 2 - is associated with apple allergy (24/24), Bet v 1 -/Bet v 2;+ is associated with 39% apple allergy (7/18), Bet v 1 +/Bet v 2;+ is associated with 56% apple allergy (14/25). Hazelnut follows apple but profilin sensitization "is very likely in the presence of OAS to citrus fruit, the gourd family, banana, and/or tomato". In northern and central Europe, where birch trees are common, allergic cross-reactivity based on homologous structures present in birch pollen (Bet v 1) and apple (Mal d 1) leads to the birch-pollen syndrome. Symptoms are confined to the Oral allergy syndrome (Hoffmann-Sommergruber and Radauer, 2004) . In areas where birch pollen is rare or absent, such as the Mediterranean basin, allergic reactions to apple may be due to either cross-sensitization to the pollen pan-allergen profilin or to primary sensitization to non specific lipid transfer protein (nsLTP) in the fruit itself (Marion et al. 2004) . Marion D, Douliez JP, Gutier MF, Elmorjani K.
Plant Lipid transfer proteins: Relationships between allergenicity and structural, biological and technological properties. Pastorello EA, Pravettoni V, Farioli L, Ispano M, Fortunato D, Monza M, Giuffrida MG, Rivolta F, Scibola E, Ansaloni R, Incorvaia C, Conti A, Ortolani C.
Clinical role of a lipid transfer protein that acts as a new apple-specific allergen. Allergy to nonspecific lipid transfer proteins in Rosaceae: a comparative study of different in vivo diagnostic methods. Anhøj C, Backer V, Nolte H.
Seasonal variation in food allergy to apple. Double-blind, placebo-controlled food challenge with apple. Osterballe M, Scheller R, Stahl Skov P, Andersen KE, Bindslev-Jensen C.
Diagnostic value of scratch-chamber test, skin prick test, histamine release and specific IgE in birch-allergic patients with oral allergy syndrome to apple. Vanek-Krebitz M, Hoffmann-Sommergruber K, Laimer da Camara Machado M, Susani M, Ebner C, Kraft D, Scheiner O, Breiteneder H.
Asero R, Mistrello G, Roncarolo D, Amato S, Zanoni D, Barocci F, Caldironi G.
Detection of clinical markers of sensitization to profilin in patients allergic to plant-derived foods. As a consequence of sequence identities, IgE to Mal d 1 cross-reacts with the allergenic Bet v 1 homologous from celery (Api g 1), carot (Dau c 1) and cherry (Pru a 1) and with major pollen allergens from the order Fagales , including birch (Bet v 1) (Ebner et al. 1995), alder (Aln g 1), hazelnut (Cor a 1) and Car b 1. A number of Mal d 1 isoforms have been isolated, cloned and sequenced from different cultivars (Son et al. 1999). The authors concluded that the occurrence of the isoforms is not cultivar-related , and that a mixture of isforms is present in the fruit. Helsper et al. (2002) showed that the main isoform of Mal d 1 expressed in apple is the Mal d 1b. The allergenic potency of different cultivars found by Vieths et al. (1994) is related to total level of expressed Mal d 1 isoforms. Helsper JP, Gilissen LJ, van Ree R, America AH, Cordewener JH, Bosch D.
Quadrupole time-of-flight mass spectrometry: a method to study the actual expression of allergen isoforms identified by PCR cloning. Apple allergy: the cDNA sequence of the major allergen of apple determined by performing PCR with primers based on the N-terminal amino acid sequence is highly homologous to the sequence of the major birch pollern allergen. Purification and characterisation of the major allergen from apple and its allergenic cross-reactivity with Bet v 1. Characterisation of apple 18 and 13kD allergens by microsequencing and evaluation of their content during storage and ripening. Vieths S, Jamek K Aulepp H, Petersen A. Isolation and characterisation of 18kD major apple allergen and comparison with the major birch pollen allergen (Bet v 1). MdAP, a novel protein in apple, is associated with the major allergen Mal d 1. A 31 kDa protein isolated by Hsieh et al. (1995)  shared 46% identity with thaumatin-like proteins belonging to the pathogenesis-related proteins of PR-5 group, involved in plant defence against fungi. Recombinant Mal d 2 exhibits antifungal activity against Fusarium oxysporum and Penicillium expansum, implying a function in plant defense against fungal pathogens (Krebitz et al. 2003) . Menu-Bouaouiche et al. (2003)  demonstrated that purified apple TLP did not display any antifungal activity against Aspergillus niger, Botrytis cinerea, Candida albicans, Fusarium gramineum, Penicillium commune, Phytophthora infestans, Trichoderma viride and Verticillium albo-atrum. Natural Mal d 2 was purified from apple protein extract using the reversed-phase HPLC column C8 Hypersil WP 300, 10 µm, 8 mm×250 mm and a linear gradient of 2-propanol (solvent A: 0.1% trifluoroacetic acid in water; solvent B: 90% 2-propanol, 0.1% trifluoroacetic acid; gradient: of 0\Z80% of solvent B) (Krebitz et al., 2003) . Apple fruit pieces were homogenized in 50 mM acetic acid. After filtering the pH was adjusted to 1M acetic acid, pH3 and the extract was centrifuged at 9000 g (15 min). The cleared extract was purified using a S Fast Flow column equilibrated with 20 mM acetic acid and the protein eluted with 50 mM Tris-HCl (pH 7.8). The partially purified protein fraction was adjusted to pH 3.0 with 1 M acetic acid, centrifuged (9000 g, 15 min) and loaded onto the same column. The protein was eluted with 20 mM Na-formate buffer (pH 3.8) containing 0.0\Z0.5 M NaCl in formate buffer (Menu-Bouaouiche et al. 2003) . The protein has been termed Mdt1 by Oh et al (2000) . It has a pI of 5.1 and possesses one putative N-glycosylation site. It is homologous with the thaumatin-like proteins of cherry. Krebitz et al. (2003)  purified recombinant Mal d 2 with two putative glycosylation sites and a calculated pI of 4.55. Kim SH, Lee JR, Kim SR. Isolation of a cDNA encoding a 31-kDa, pathogenesis-related 5/thaumatin-like (PR5/TL) protein abundantly expressed in apple fruit (Nalus domestica cv. Fuji). Experimental Masses:9078 Da by MALDI-MS (Sanchez-Monge et al. 1999 ). nsLTPs are alpha-helix bundle proteins with four disulphide bonds. It has been suggested that this cross-linked structure leads to the heat stability of apple LTP, which binds IgE after 30 minutes at 100 °C (Asero et al. 2003 ). Sancho et al. (2005)  similarly showed that Mal d 3 resists heat treatment at 90°C for 20 min but shows reduced IgE reactivity after more severe heat treatment at 100°C for 2 hours. It is also relatively stable to proteolysis (Asero et al. 2000 ). The deduced primary structures for Pru p 3 and Mal d 3 showed 82% identity which explains the cross-reactions between these proteins (Diaz-Perales et al. 2002 ). Immunoblot inhibition assays confirmed these cross-reactivitiy (Sanchez-Monge et al. 1999 ). Mal d 3 exact function has not been determined but plant nonspecific lipid-transfer proteins are involved in transport of fatty acids both intracellular and extracellularly; and cutin monomers to the cuticular layer of leaves and fruits. There is an expandable cavity between the four alpha-helices which can bind one or two lipids. nsLTPs have also been reported to act as plant defense proteins against bacterial and fungal infections and form the PR14 family of pathogenesis related proteins. It is possible that a lipid-like post-translational modification is involved (Kader 1996 ; Lindorff-Larsen et al. 2001 ). Ground apple skins are extracted with PBS (1:10, wt:v) for 1h at 4C, After centrifugation at 10,000rpm for 25 min, 4C, the supernatants are dialysed and freeze dried. The protein was then exchanged into 0.1M ammonium acetate, and defatted with cold acetone, followed by ethanol:ether (1:3, v:v) for 1h at 4C. The residues were dried and applied to a C4 reverse phase column (Vydac 22x250mm, 10um particle size) using a two step linear gradient of acetonitrile in 0.1% (v:v) trifluoroacetic acid (0-40%, 120min; 40-85min 30 min using a flow rate of 1ml/min) (Sanchez-Monge et al 1999 ). In another study (Pastorello et al 1999 ) apple LTP was extracted from apple peel (cv Golden Delicious) by homogenisation 3:1 (w:v) in PBS. 2% (w/v) polyvinylpyrrolidone, 2mM EDTA, 10mM diethyldithiocarbamate, 3mM NaN3. Extracts were clarified by centrifugation (16,000xg) at 4C, 30min, dialysed against PBS and concentrated in a centrifugal concentrator (3kd cut-off filter). This extract was loaded onto a Resource-S cation exchange column equilibrated in 30mM sodium citrate buffer pH 6 and the LTP eluted with 1M NaCl (20 column vols, 6ml/min). A final gel-permeation chromatography step on Superdex 75 in citrate buffer (pH 6.0) was then performed. Zuidmeer et al. (2005)  purified recombinant Mal d 3 (and Pru p 3) using the yeast Pichia pastoris. Proteins were purified via cation exchange chromatography. Sancho AI, Rigby NM, Zuidmeer L, Asero R, Mistrello G, Amato S, Gonzalez-Mancebo E, Fernandez-Rivas M, van Ree R, Mills EN. The effect of thermal processing on the IgE reactivity of the non-specific lipid transfer protein from apple, Mal d 3. There are only few studies on the stability of profilins most of them on celery profilin. Compared to other allergens, profilin is a moderately stable protein, more resistant than Bet v 1 homologues but less stable than lipid transfer proteins or cross-reactive carbohydrate deteminants of glycoporein allergens. Apple profilin is thought to be an actin-binding protein.